The zinc finger domain of a transcription factor binds to DNA. The rest of the protein, not shown, is considerably larger. 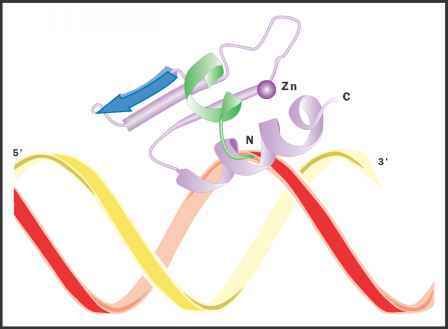 The zinc atom binds to two amino acids in the upper loop, and two others in the lower helix. Adapted from Dutnall, 1996. Gene-specific factors are known as activators or repressors, depending on whether they increase or decrease the rate of transcription. The DNA sequences that activators bind to are called enhancer sites; repressors bind to silencer sites. Since enhancer and silencer sites are on the same DNA sequence as the gene they control, they are called "cis" regulatory elements (from the Latin word for "side"). The factors that bind to them come from elsewhere in the genome and are called "trans" acting factors. Many gene-specific factors bind to the promoter outside of the TATA box, especially near the transcription initiation site, the beginning of the DNA sequence that is actually read by RNA polymerase. Others bind to sequences within the coding region of the gene, or downstream from it at the termination region. Some bind to DNA sequences hundreds or thousands of nucleotides away from the promoter. Because of the looped structure of DNA, these sequences are physically close to the promoter, despite being far away along the double helix. The binding sites of transcription factors can be determined by "DNA footprinting." Gene-specific factors work in a variety of ways. 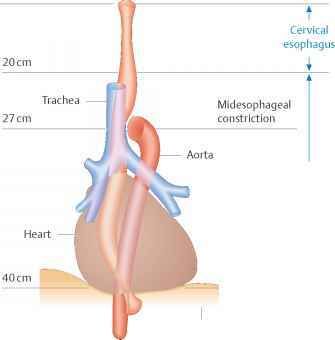 Some interact with the basal factors, altering the rate at which they bind to the promoter. Some influence RNA polymerase's rate of escape from the promoter, or its return to it for another round of transcription. Some factors physically alter the local structure of the DNA, making it more or less accessible. In eukaryotic organisms, DNA is wound around protein complexes called histones and is further looped, coiled, and condensed to allow efficient packing in the cell nucleus. This arrangement keeps the DNA well ordered but also decreases its accessibility for transcription. By interacting directly with DNA, transcription factors can open up otherwise inaccessible regions.